“Alps” and “Tech” are some of our favorite words so this hat quickly caught our attention. Plus, who doesn’t like a good beanie? Atomic used a combination of 91% Polyester and 9% Spandex make this cap 100% complete. One size fits most heads and it is thin enough to be worn under a helmet. The Alps Tech Beanie is a helpful head-companion for any mountain athlete getting out in the dead of winter. Also works in the spring but you can take it off in the summer. Unless you are the type to wear beanies indoors, then clearly temperature is not a driving factor. In that case, go ahead and wear it through fall and into the next winter. 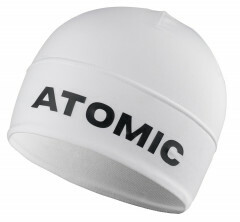 Atomic will appreciate the year-round shout-out.